Wings up - a male cricket chirps. This week we turn our attention from unsavory home invaders like stink bugs and black vine weevils to a most entertaining and downright amusing visitor, the fall field cricket. Several weeks ago chirps from the basement announced the annual visit of field crickets to my home. I tracked and captured two male crickets, one of which was missing a hind leg, and a rather portly female full of eggs. Never one to stand in the way of romance, I placed the trio in a small terrarium. Within moments the smaller male, the five-legged fellow named Pete, challenged his cohabitant, Bud, to a duel that resulted in boisterous chirping, snapping of jaws, and grappling with forelegs. The more aggressive Bud soon vanquished his challenger and Pete retreated to a quiet corner of the terrarium. Basking in the autumn sun allows this gal to warm up. For centuries Chinese gamblers have wagered high stakes on the outcome of cricket fights. An interesting trick used by the cricket handlers to resuscitate losers of bouts is to shake the defeated warriors and toss them in the air several times. This dramatically reduces the recovery time and allows the small combatants to return the arena in minutes rather than the regular convalescent period of days. A study published in Nature confirmed the success of this therapy in helping defeated crickets regain their fighting spirit. Rather than interrupt Natures’ course, I allowed Pete to sulk in the corner. Shortly after his victory, Bud initiated a series of soft chirps and his efforts were soon rewarded by a visit from the robust female, Wendy. What useful information is carried in the male cricket’s song other than the typical male plea for female attention? 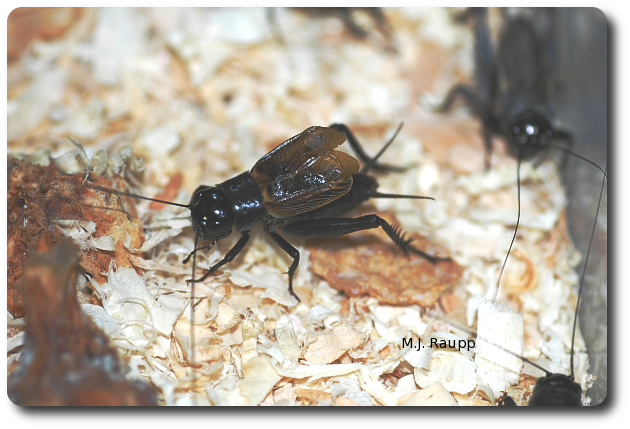 A fascinating study by two Finnish scientists of the Mediterranean field cricket, Gryllus bimaculatus, found a link between the male cricket’s song and his immune response. Troubadours with a highly attractive song also had superior immune systems. If the ability to ward off diseases due to superior immune function can be passed along to progeny, then females that choose a mate with an enhanced immune system may ensure better survival of their offspring. By demonstrating his superior immune system with a song, the male cricket may win the lady. One last thought about the cricket and his song, relates to Old Man Winter who is just around the corner. As you know, insects are cold blooded. The body temperature of an insect is more or less the same as the environment that surrounds it unless it basks in the sun or uses muscles to elevate its temperature. You may have noticed the activity of insects in general and the chirping of crickets outdoors has declined dramatically with falling temperatures. Many years ago a noted Entomologist, Richard Alexander, demonstrated a simple relationship between ambient temperature and how often a cricket chirped. This relationship has been used to estimate the temperature outside. Simply count the number of chirps in 15 seconds, add 37, and you will approximate the temperature in degrees Fahrenheit. Of course, if it is below 37 degrees, the crickets will not be chirping much and it might be better to go inside and ponder crickets and their songs over some hot chocolate. The following articles were used in preparation for this Bug of the Week: Courtship song and immune function in the field cricket Gryllus bimaculatus by Markus Rantala and Raine Kortet, Aggressiveness recovers much faster in male crickets forced to fly after a defeat by Hans A. Hofmann and Paul A. Stevenson, and Seasonal and daily chirping cycles in the northern spring and fall field crickets Gryllus veletis andGryllus pennsylvanicus by Richard Alexander and Gerald Meral. To learn more about crickets, their songs and fascinating behaviors, please visit the following web sites.